The movie is humorously self-aware, packed with cameos and filled with fun musical numbers. The jewel heist is all-too familiar territory and the story is a little slow in parts. Clark Kent’s glasses concealed his true superhero identity from a city of millions, so it’s not so surprising that a little green makeup over a mole might hide a criminal mastermind from a train filled with Muppets. Number one villain Constantine—the world’s most dangerous frog—escapes from a Russian gulag. With a simple disguise and the help of his number two (Dominic Badguy, played by comedian Ricky Gervais), a conniving Constantine frames Kermit, fools all his best friends and joins the Muppet world tour. 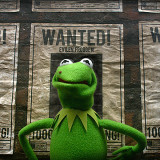 The evil “Kermit” charms Miss Piggy, lets Gonzo and the gang run amok and pulls off a series of high-profile robberies. CIA agent Sam the Eagle and Interpol’s Jean Pierre Napoleon (Ty Burrell channeling Pink Panther’s Inspector Jacques Clouseau) reluctantly join forces to solve the case. Meanwhile, at the request of the ever-watchful guard Nadya (a secretly love-struck Tina Fey), the real Kermit directs the prison talent show highlighting the artistic sides of fellow prisoners Big Papa (Ray Liotta) and Danny Trejo. I was nervous heading into this latest adventure—especially after seeing the bizarre and joyless Lady Gaga television special featuring these felt-covered friends. While it is a bit darker than the last film and a little slow toward the end, Muppets Most Wanted stays true to its roots and packs plenty of laughs for fans of all ages. Perhaps we’ll get an eighth big screen installment in the not-so-different future.